I woke up this morning and checked my messages to find I have been nominated for the Beautiful Blogger Award, thank you so much http://wipingbuttsandtakingnames.com for choosing me!! Tell us 7 things about yourself. 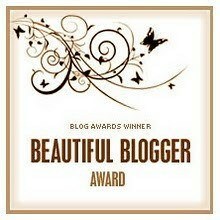 Nominate 7 other bloggers for their own Beautiful Blogger Award, and comment on their blogs to let them know. I have a gorgeous little boy called Freddy, he is my world. I enjoy nothing more than a cup of tea and stack custard creams. I studied Art and Design. My favourite music is anything by George Michael. I am an addicted to ebay, I love selling my junk and buying new things. I have an orange car called Hugo. I’m getting married in September. And here are my blogger nominations, please check out these fantastic blogs! Next Post Today’s Charity Shop Find! Thanks so much! Look out for my post!